The widely used Portable Document Format (PDF) for page-based documents was introduced by Adobe in 1993. It is based in large part on the Postscript page description language for modern printers, which had been developed in the late 1970s/early 1980s. In 2008 the specification for PDFs was made available by Adobe as a royalty free open standard and adopted by the International Standards authority (PDF32000). A very good summary of the history and technical aspects of PDF files is provided on WikiPedia. The sections below provide more practical information based on our own experience of using PDFs and PDF tools over the past decade. 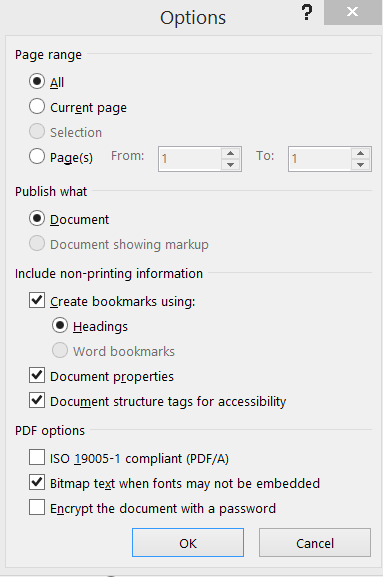 One of the most important features of PDF documents is they are defined by a PAGE BASED model - this describes how individual pages in the document are made up, in terms of the text, the fonts used, graphical objects, interactive elements and possibly other features associated with the page. This PAGE BASED model means that when you look at a PDF page on-screen or on printed output, it should always look the same and as specified by the designer. This is completely different from formats such as ePUB and HTML, which are not page based - they are effectively a linear stream of items, one after another, with limited "layout" elements (ePUB3 and HTML5 have improved on this of course, but they are still very much flexible, flowable formats). The two approaches have been designed independently, with a major aim of formats like ePUB being to allow the text to be the dominant element, re-sizable and re-flowable, ignoring the page concept and focusing on the size and orientation of the device on which it is viewed. ePUB and its variants and versions is the most widely used format for reading eBooks documents on mobile devices, including of course Amazon Kindle, Nook and other specilaized ebook reader devices. Some comments should be made at this stage about page size. Because PDF files are page-based, the underlying page size (or effective page size) matters - both for successful output to print devices and for reading on-screen. The great majority of documents that are converted into PDF format are based on A4 or US Letter page size in Portrait orientation. This has a total height of 11+ inches or 300mm. If a computer screen displays at 100 pixels per inch the screen would need a resolution of at least 1100 pixels vertically to display the page, and even then it would be very difficult to read typical text at, say 12 point size. And most computer displays, including all laptops, are less than 11 inches high so any entire page will be shrunk to fit the available screen space. Technical drawings can be even more difficult to decipher as they often include small fonts and fine lines. This does not present a serious problem for print output, as long as the printing is carried out with at least 300dpi (dots per inch) or preferrably 600-2400+ dpi. There are a number of solutions to this problem, the most obvious of which is zooming. Most PDF readers support immediate zooming to page width, and this increases the font size viewed dramatically with the result that the text is easy to read - however, a downside of this is that the page then has to be scrolled downwards and maybe sidewards in order to read the entire text on a page. This in turn has some impact on the ease with which the user can read the document, particularly if it has many pages. For reference works, where small sections are referred to, this is not really a problem, but for fully reading and absorbing a long document, it is a limiting factor. The alternative to zooming the page is for the source document to be arranged (designed to fit) on a smaller page size (e.g. A5 or one-half US Letter) and/or a landscape orientation used, and/or for the document to be created with larger font sizes. Video and Audio media files can be embedded in some Adobe-specific PDFs, but should not be embedded for general use as these will not work across platforms and readers and the resulting PDF files are generally huge and unsuitable for downloading. For video and audio files we recommend that these be created in MP3 or MP4 format and then placed on an in-network server for user access. Then within the PDF place a link to these files so they become linked rather than embedded. The resulting PDF file will work on all platforms and situations, and will remain small, even where the media files are large. 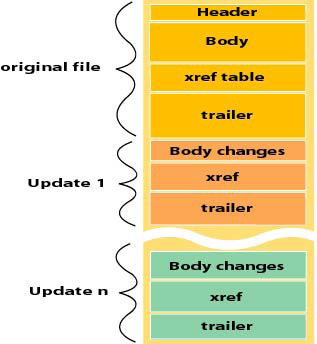 The general structure of a PDF file is composed of the following code components: header, body, cross-reference (xref) table, and trailer, as shown in figure 1. The header contains just one line that identifies the version of PDF. For Example: %PDF-1.4 is the first line of the testfonts.pdf file. If you add the two values from the version number, e.g. 1.4 -> 1+4 you get 5 which is the version of Adobe Reader needed to view a document in that version of PDF - so version 1.6, which is probably the last overall "standard" version that is most widely used, requires Adobe Reader V7 or later (or other PDF readers that handle PDF version 1.6). The trailer contains pointers to the xref table and to key objects contained in the trailer dictionary. It ends with %%EOF to identify end of file. The xref table contains pointers to all the objects included in the PDF file. It identifies how many objects are in the table, where the object begins (the offset), and its length in bytes. The body contains all the object information — fonts, images, words, bookmarks, form fields, and so on. When you perform a Save operation on a PDF file, the new, incremental information is appended to the original structure (see figure 2); that is, a new body, xref table, and trailer are added to the original PDF file. Mac computers will create PDF files from almost all appropriate applications, including the basic Pages and office-related facilities included as standard with OSX. Similar facilities exist within Linux. In addition to the above options, there are many "print drivers" which will create a simple PDF as output from any desktop application under Windows, just by printing the material to a specially installed printer ... in this case, a non-physical print device. The result is a PDF with very little functionality, but usable for many basic applications.